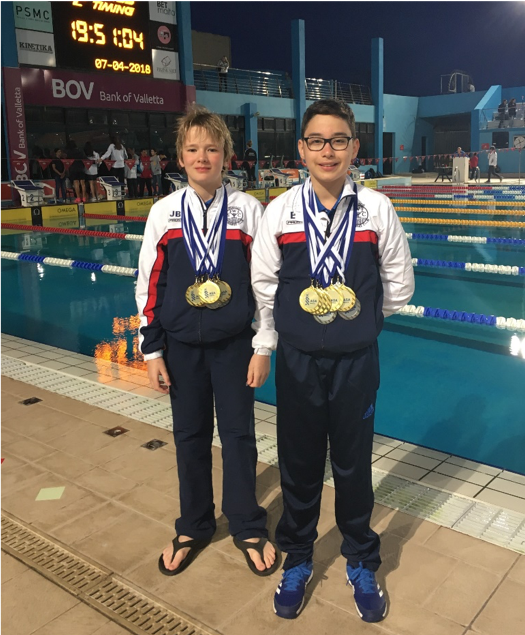 Two of our County squad swimmers flew out to Malta to compete in the Guess Malta International meet. They both swam ten events each and came back with an impressive 18 medals between them. Jude Borg-Cardona 3 Gold, 3 Silver and 3 Bronze and Edwin Valentin-Ivanescu 5 Gold and 4 Silver. They competed in their chosen events against 25 teams from Malta, Italy Hungary, Sweden and Poland to name just a few, so were in some very company. The pool was a bit of a challenge to start with as it was a 50metre outdoor pool and both having to swim backstroke with no ceiling and glorious sunshine shows how good you really are! Coach Chris Glover who accompanied the swimmers alongside the parents was impressed with the speed of which the boys both adapted to the outdoor environment. “Its not easy swimming outside as the wind is also a factor on the starting blocks, but they both coped superbly well. Jude, now is eligible to swim in the Maltese nationals later this year as his father is from Malta.